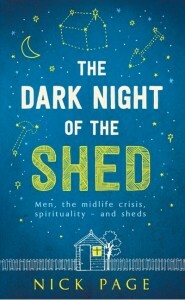 The Dark Night of the Shed is a book about Men, the midlife crisis, spirituality and sheds. Why do so many men have so much and yet feel as though they have failed? Why do some men start wearing Lycra and running up mountains, while others don a toupée and run off with another woman? Visit the dedicated The Dark Night of the Shed website.